You don’t have to dress well to record triple-doubles that rival Jordan and Bird. The right layering off-court won’t lend itself to doing so in four consecutive games. Your coach will never turn to you and say, “Great work in the post tonight. Now, let’s talk about your post-game fit.” Still, answering questions about how you put the team on your back while draped in your most runway ready garb has become its own unspoken competition. Russell Westbrook knows. The four-time NBA all-star and NBA Live 16 cover star has become one of the most fashion-forward players in the league. Just picturing him behind the mic already conjures images of his near signature clear frames, his carefully selected bespoke outfits. Even at his most vibrant, he’s the antithesis of Craig Sager. 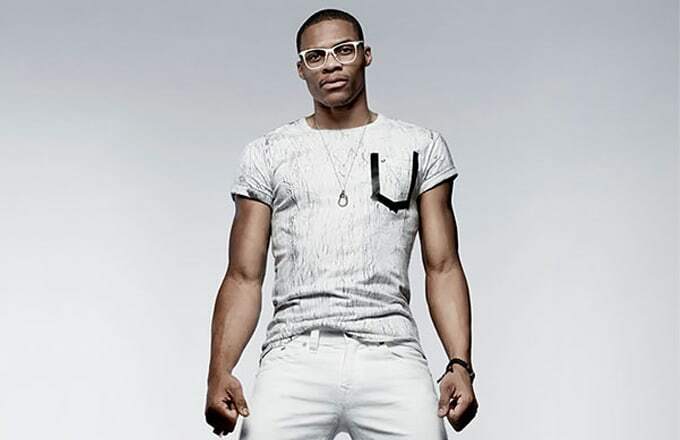 So it goes that Westbrook has become an increasingly active member of the fashion community. In addition to collaborating with Barneys New York for both summer and spring collections, the Oklahoma City Thunder guard recently launched his own line of eyewear. This year, he’s become the campaign creative director for True Religion. On a Wednesday night in L.A., we ventured to a Griffith Park studio to talk to Westbrook about fashion and his role with the newly reimagined denim brand. Inside a cavernous and dimly lit studio, racks of the latest from True Religion buttressed every wall. Denim in dark and distressed washes, jean jackets, and shirts with Westbrook’s number emblazoned on the back in reflective print—this was not the same brand 2 Chainz brought you in 2011. Around 8 p.m., after an entire day spent shooting on a mock-runway surrounded by a constellation of blinding lights and a coterie of 360-cameras, Westbrook reclined in a director’s chair inside his dressing room. Though hadn’t dropped 49, 16, and 10, he was understandably tired. Still, once our interview began, he was as focused and attentive as you’d imagine one of the NBA’s best point guards. He also laughed a few times. Whether or not he’s heard of Lil B is up for interpretation. What do you think of the denim-on-denim look? Is there a trick to doing it right? I think it all depends on the shoes. Denim-on-denim is cool, but I think shoes make it all go together. What kind of shoes do you like to pair with that look? It’s tough to say. It may be some boots. You never know. Sandals. It’s all about whatever look you’re going for. Do you have a go-to pair of sandals? No. I don’t wear sandals. [Laughs.] I don’t wear sandals, bro. But in fashion a lot of people wear sandals. I’ll wear anything else, but I don’t wear sandals. Say your closet is a basketball team. Which pieces are in your starting five? I’d wear a button-up. Obviously you need shoes. Some jeans. A leather jacket. And [I’d wear] a watch. I don’t wear sandals, bro. But in fashion a lot of people wear sandals. I’ll wear anything else, but I don’t wear sandals. A point guard is essentially the anchor of a team, running the offense and creating opportunities for other players to shine. What would you say is the ‘point guard’ of any stylish outfit, the piece that keeps everything tied together? When you wear a suit, a pocket square can kind of pull everything together. If you wear denim, like we were saying, I think the shoes can pull everything together. If you’re wearing just a normal outfit, maybe glasses could pull everything together. It all depends on what you’re wearing. If you got all black on, you could throw on a nice white hat. It all depends on where you’re going and what you’re dressing for. Many denim brands don&apos;t go above 34" length. You&apos;re a tall person. You hang out with extremely tall people. How do NBA players find jeans with the right inseam/fit? I don’t know how they do it, but I can fit off the rack. I’m cool. I don’t know what they do or how they figure it out, but I know I can fit off the rack. You’ve never asked any of your teammates? I don’t really worry. [Laughs.] That’s not my problem. But I’m pretty sure some of them get [their jeans] custom made, some wear certain brands that are longer. But I can wear everything off the rack. What do you hope to accomplish in working with True Religion? What is your overall goal? To find a way to be creative and bring my creative side to True Religion. Obviously is a great brand. They’re fresh and they have different washes in denim, and my job is to be able to come in and try to find ways to be creative. If you hadn’t played basketball, do you think a career in fashion is something you would’ve pursued? I don’t know. I’m not going to lie to you. Probably not. It depends on what would’ve made me the most money at the time. Do you have any songs that you like to listen to when you’re getting dressed? No. I listen to all types of music. I listen to a lot of west coast [rap]: YG, Ty Dolla $ign, Kendrick. Are there any past NBA players who’ve inspired you in terms of fashion? No. My mom [inspires me].